The Sprint-binder PB-600R, PB-1200R and PB-2000C systems are designed to be fed from a stream of sheets directly from a digital printer. 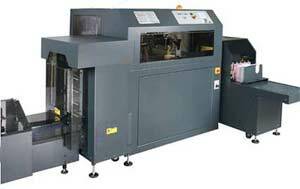 Optional in-line folding can reduce the sheet format size to the required finished book size, if needed. The sheets then enter a stacker where they are collected on top of each other to form book blocks. These book blocks are rotated to the vertical and pushed automatically into the clamp of the single-clamp Sprint-binder PB-600, 4-clamp Sprint-binder PB-1200R or PB-2000J. Optional in-line book trimming is available after binding. The Sprint-binder PB-600R system produces high quality books up to 60mm thick at speeds up to 600 books/hour in-line with a digital printer (click HERE to view configuration options). 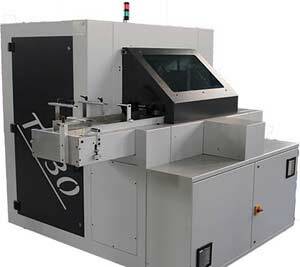 The Sprint-binder PB-1200R system produces high quality books up to 60mm thick at speeds up to 1200 books/hour in-line with a high speed digital CF web printer (click HERE to view configuration options). The Sprint-binder PB-2000J system produces high quality books up to 50mm thick at speeds up to 1500 books/hr in-line with a high speed digital CF web printer (click HERE to view configuration options). Refer to IBIS for detailed specifications.